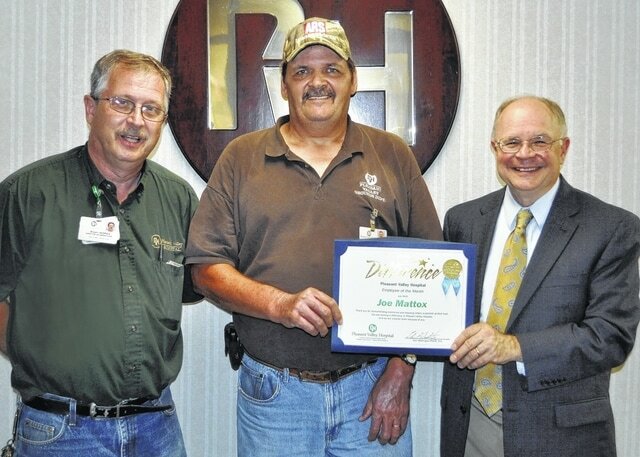 POINT PLEASANT — Pleasant Valley Hospital’s Customer Service Employee of the Month for July is Joe Mattox in the Grounds Department. Mattox began his career with PVH in December 1998 as a groundskeeper. Mattox was nominated by his peers for his willingness to help others. They say he is a hard worker who rarely misses work. They added that during his 17 years of service, he has demonstrated diligence and dedication to Pleasant Valley Hospital. Mattox and his wife of 22 years, Bev, live in Leon. They have one grown son, Josh. Mattox enjoys hunting, fishing, farming and attending Leon Baptist Church. In recognition, Mattox received a $50 check and a VIP parking space. He will also be eligible for the Customer Service Employee of the Year award with a chance for $250.